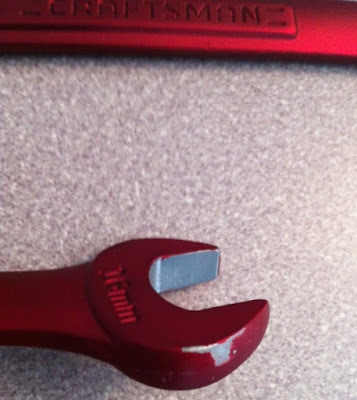 This is not a noticeable defect until you bang your part around a little and see that your powder is chipping off. Powder coating is not indestructible and even a properly applied finish can be scratched or chipped if it is impacted with enough force or is exposed to sharp objects. 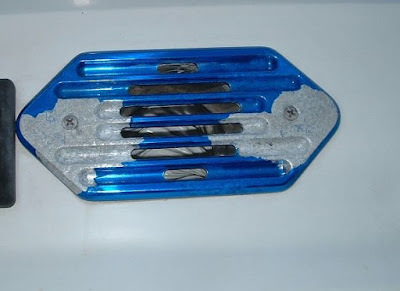 However, it is a very durable finish so if your powder coating finish seems easily chipped and fragile, there are some things you need do to correct it. The following topics are all possible reasons for easily chipped powder coat. Over-cured / Under-cured: The most common reason for a non-durable powder coat finish is that the powder is under-cured. However, over-curing can also produce similar results. When a powder coated part is curing in the oven, it goes through several stages of curing and if you remove the part from the oven too soon or if the temperature is not high enough in the oven, then the powder cannot complete its full cure cycle. This often leads to a powder coat finish that easily chips. The correct way to fix this is to monitor the temperature of your parts inside of the oven and only start the timer when the part has reached the correct temperature. Every powder that you use will have a "cure schedule" and this tells you how long the powder needs to cure for and at what temperature. The most common cure schedule is: 400 degrees F for 10 minutes. This means the actual temperature of your part needs to be 400 degrees F throughout and it needs to maintain that temperature for 10 minutes. The easiest way to do this is by using an infrared thermometer to check the temperature of the part while it is in the oven. Once it reaches the correct temperature, you can begin the timer. Periodically check the temperature throughout the 10 minutes to ensure the temperature hasn't drifted and turn the oven off once the 10 minutes are completed. This procedure is throughout discussed in this article, I strongly recommend reading it to make sure you are using your IR thermometer correctly: Monitor Temperatures using an Infrared Thermometer. To ensure that you do not under-bake the part, it is an accepted practice to leave the part in the oven for a couple of extra minutes. If it says 10 minutes, I will leave the part in for 12 or 13 minutes. This is allowable because most powders are over-bake stable and will experience no issues if left in the oven for a couple of extra minutes, but it does ensure that your part is fully-cured. Over-baking a part can also result in a fragile powder coat finish. It also often causes your colors to brown or yellow and is usually very obvious once you remove your part from the oven. Closely monitoring your parts with an infrared thermometer will remedy this issue as well. The correct way to repair a part that is chipping due to under-curing / over-curing is to strip the powder coat completely and re-do it. Insufficient prep work: If the part is not prepared correctly or at all, it can also cause the powder to chip easily. Powder coating does not adhere well to a completely smooth surface. It needs a textured finish or some "tooth" to grab on to. This is why parts should always be media blasted or chemically pre-treated before powder coating. Media blasting with the correct media provides a textured finish that the powder mechanically bonds to. You can also opt to chemically treat your parts with a phosphate pre-treatment, however, media blasting often provides superior results. For the best, most durable finish, you can media blast first, and then do a phosphate pre-treatment. Too much powder: Another common reason why powder coating can chip easily is if the powder coating finish is too thick. 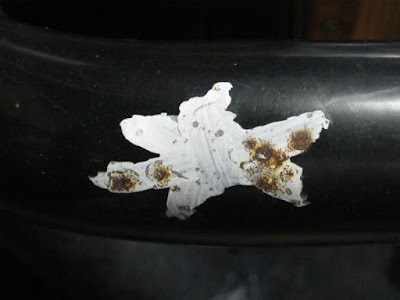 If the coating is too thick, any time the part is bumped by another object, that object has move leverage on the powder coating finish which makes it easier to knock a chunk off. It is very important to apply the correct amount of powder on a part for this reason and also because too much powder often results in lots of orange peel. You can measure how much powder are applying to your part with a Coating Thickness Meter. This is used after you have cured the powder coat and it is non-damaging to the surface. Once you get a reading, you can ensure that it is within the correct limits for the specific powder you are using. If the reading is way too high, it is best to strip the part and re-do it while focusing on applying much less powder. Keep in mind, that when you spray multiple coats of powder, it is normal that the thickness will increase, the important thing is that the powder is cured in-between each coat of powder. A general rule of thumb, especially for those using cheaper hobby guns like the Eastwood Powder Coating Gun or the Harbor Freight Powder Coating Gun, you should aim to use as little powder as possible. The reason why I say this is because these guns are not good at getting powder into the hard-to-read Faraday areas and the more you try, the more build-up of powder you will end up with on the rest of your part. So always spray the Faraday areas first, and if you have a build-up of powder on the rest of the part, blow it off of those areas and coat it with the thinnest amount of powder possible WHILE still getting complete coverage. Make sure to check for complete coverage by shining the part with a bright LED flashlight, it will highlight any missed spots. 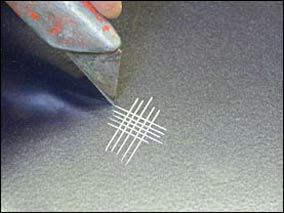 Another method is to place a piece of tape over the crossed hatched area and quickly rip it up. If the tape rips up powder, it failed the test.